If you want to get to the heart of a persistent and pervasive cultural disquietude you shouldn’t turn to Yahoo Answers. I’ll do it for you. ok not everyone hates jews. i mean i dont. like in school people ask’ are you Jewish?? ?’ and they say it as though theres something wrong with that. but theres not. i just wanna know what people have against them???? any help???? You would think that after 3000+ years of antisemitism… They would be able to at least give ONE reason other then obvious lies like “They want to rule the world” or “They control all the money”. It makes no sense to me and it is only a matter of time before this post is deleted for no apparent reason. I don’t hate jews. I’m black and when I was little my mom would drop me and my brothers off at the synagogue by our home because they were always hosting religious camps for children. They were very nice to us and we are christian. I don’t have a problem with jews, they’ve never done anything to me. A lot of the boss and owners of certain businesses are mostly Jews so that might be the problem. You know how a lot of people has problems getting along with their boss. A lot of my friends and best friends are Jewish and I get along with them best. Some people just doesn’t have flexible minds. i think it’s because of their religion. i mean not all people that have a religion, but some of them go bashing jews for not believing in god or something. i have a few jewish friends and they are the nicest people ever. Yes…it’s weird to me too. Especially when they are racist white people. Jews…are white, right? omg i freaking heart the internet. This entry was posted in Google Game and tagged Google Game, jews, so annoying. Bookmark the permalink. I’m so glad you researched this topic at 345 in the morning. Nothing like cyber anti-semitism to lull you to sleep. …the world, and that’s why they’re so annoying. 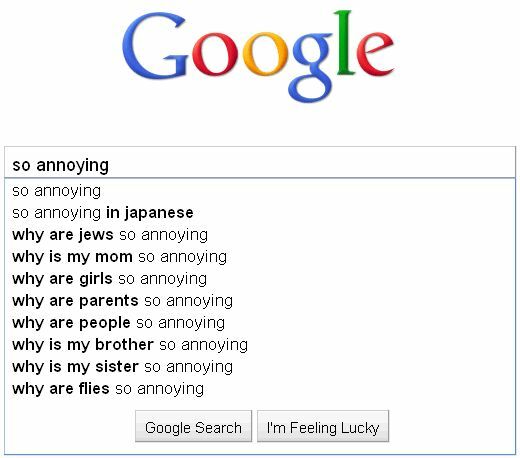 I find myself a little annoying, and I’m a Jew, so that explains it. I think. Oh my god, I love Kevin — who’s Kevin? Folks, that last comment was from my mom. She is one of my most loyal readers and the composer of several hilariously tasteless anonymous comments. She is, as the kids say, the bomb. Ma, sorry to out you like that. You may or may not have met Kevin — but you certainly would love him. I certainly have met him — and may or may not love him.